Hotel room promos anyone? 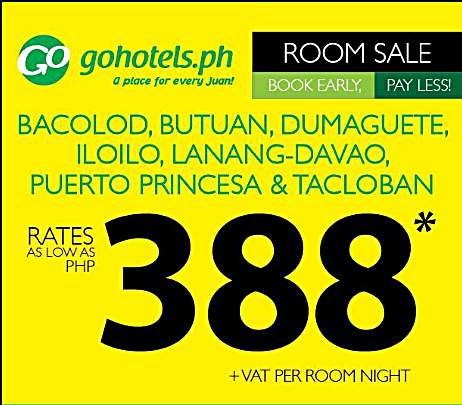 The Go Hotel Chain of budget hotels is offering hotel room sale for travelers for as low as P388 +VAT in selected branches. The Go Hotel P388+ promo is available for hotel stays from April 1, 2017 until May 31, 2017. Booking for the P388 hotel room sale should be made from November 29 to December 5, 2016. To get the hotel discounted rate, you need to make an advance booking for the hotel room. Selling date is until December 5, 2016 only. Booking for your upcoming hotel stay in 2Go Hotels can be done by booking online in their website: www.gohotels.ph or by calling their hotline (63-2) 3988788. 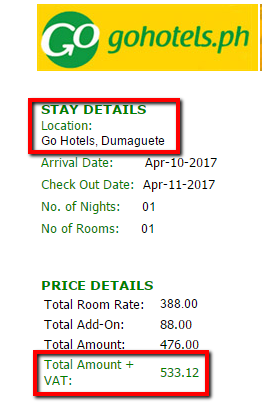 We shared below the hotel room price we have booked for April 2017 under the P388 promo. When booking, you may choose either the Twin room or Queen room. Both rooms are good for 2 adults and 1 child. Room rates vary per night and limited room availability. You may also order set breakfast for dine -in during your stay. However, you have to place your set breakfast order online up to 2 days prior to your check-in date. Check the List of Holidays and Long Weekends for 2017 so you can plan your vacation. Now, determine your destination and vacation dates so you can book the Go Hotel discounted hotel room stay and save on accommodation expenses! With airline low fares and sale hotel room accommodation, you can fully enjoy your vacations. Book na at the Go Hotel branches with hotel room promos! LIKE and FOLLOW us on Facebook at PISO FARE Tickets for more hotel room promos, airline Piso Fare, promo fares and travel tips!